Crews have begun to clean up a jet fuel spill on Highway 401 east of Cambridge, Ont. that occurred early Sunday after a crash involving a tanker truck. The spill initially closed Highway 401 in both directions between Townline Road and Highway 6 South, but Ontario Provincial Police have reopened all westbound lanes in the area except one. One westbound lane, approaching Highway 6 North, remains closed as the cleanup continues in the eastbound lanes. <a href="https://twitter.com/...fw">#hwy401</a>W/B lanes re-opened after early morning tanker truck rollover. Lane 1 W/B remains closed approaching Hwy 6 North for cleanup and recovery in the E/B lanes. 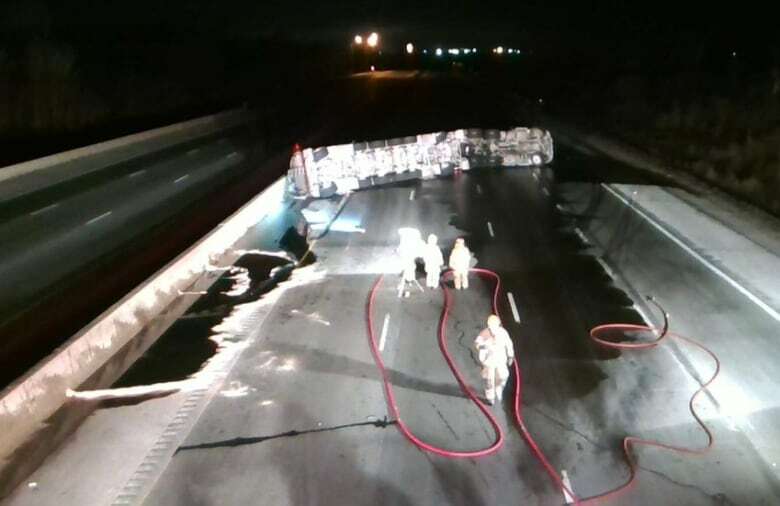 The tanker truck, carrying 50,000 litres of jet fuel, struck a passenger vehicle in the 401's eastbound lanes, east of Highway 6 North, at about 1:40 a.m., according to Const. Robert Visconti, spokesperson for the OPP's Highway Safety Division. Visconti, based in Port Credit, Ont., said the truck fell onto its side and spilled fuel all over the highway. Its driver, who suffered minor injuries in the crash, was taken to a local hospital. The driver of other vehicle in the crash, believed to be a small SUV, was not injured. All eastbound traffic is still being forced off at Townline Road. Police said a cleanup company is at the scene and it is not known when the highway will fully reopen. Earlier, Visconti said it was difficult for police to find the right company to do the work. "It was a bit of a logistics nightmare this morning trying to find a company that would actually come out to clean up jet fuel," he said. "I can only imagine, once they get there, it will be several hours of cleanup before we can get the highway reopened." Ontario's environment ministry has been notified about the crash because there is concern that the fuel could spill into ditches in the area.